Chris, haven't you decanned some diodes without using the tool made to do it? I know some here have and IIRC, it wasn't that difficult to do. I have many nubm44's running at 4.5a and only with my 1st one running at 5a did I have that same problem, I do use beam expanders on all my 44's at the moment which keeps the diode window from being exposed to humidity in the air because my primary is locked down at a set focus and I focus to distance with the beam expander. I was thinking with the zoom lens setup that putting a little AR coated flat glass window over the end of the 12mm module would be a good idea, but I am going to go without it and see if in this case I have that issue in time or not. 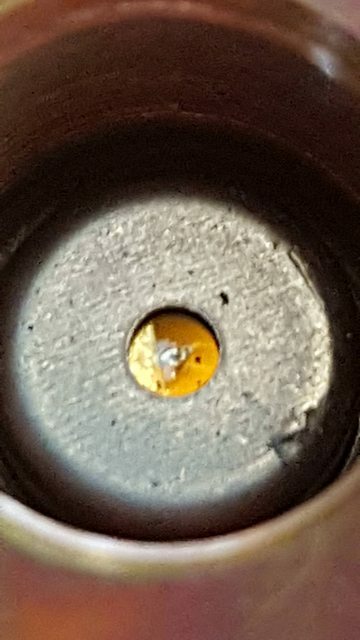 It's likely contamination, look at your diode under magnification and see what's there, I noticed bit's of fibrous material around the diode and lower module threads, not shown in pic. Note the ring of film around the perimeter of the window nearing the metal, it's slightly offset, it's curious. I took a look and my diode is filthy. I see at least 3 pieces of crap on the lens, not counting the area of the burnt out hole. I'm surprised it lasted as long as it did. I'm going to try and press out the module. Assuming I'm successful, I will decan and try again. I de-canned my NUBM44 using the Thorlabs tool, I think DTR used to have some photo's up on the web on how to do it with a small vice and pliers, can't find it now though. I am really thinking some of the glass is just being damaged by the intensity of the light when these diodes are pushed beyond specified maximum output, some of them failing, some of them not. I have other multi watt diodes this has not happened to, it seems this failure is common with this particular diode, why not for diodes just 30% less power? If contaminations are the main culprit, you should see them failing too, but we don't see that very often, but these diodes, quite frequently. Yeah, that was a good job decanning that dead diode as an example. I can't rep you again, but will get back to you.